John Joseph Clark was born 30 January 1836 in Belmont County, Ohio to Abraham and Letitia (Williams) Clark. He was raised in the Washington County, Ohio area along with his siblings: Isaiah, Phoeba Ann, Benjamin, Isaac, Amos, and William. He married Loria Wires. John passed away 27 January 1911, Belpre, Ohio (Washington County). John’s brother Amos Bateman Clark served with the 111th Illinois Volunteer Infantry, Company C, as well as his brother William W. Clark, who served with the 60th Ohio Volunteer Infantry, Company C (William serving along with his son John Henry Clark in the same company). 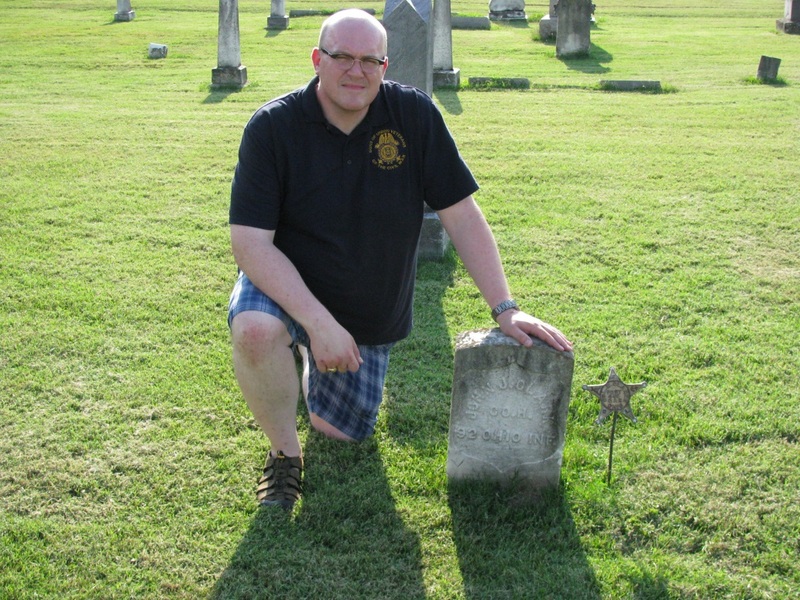 John volunteered for service with the 92nd Ohio Infantry, Company G, in August of 1862. He mustered out of the 92nd OVI on 30 December 1863 when he was transferred to the 7th Regiment of the Veterans Reserve Corps, Company H. He remained in the 7th VRC until he was mustered out of service in Washington D.C. on 29 June 1865. According to pension records, John had buckshot wounds to his chest. However, his other physical ailments from serving in the Army were the items that were listed in attempts to get him a pension later in life, and not the buckshot wounds. John Joseph Clark was a Comrade of A.H. Browning GAR Post No. 673 in Little Hocking, near Belpre in Washington County, Ohio. He was highly involved in the Grand Army of the Republic. He served as Post Commander, and for a considerable amount of years he served as the Adjutant. He was in Post No. 673 along with his brother William W. Clark, his nephew John Henry Clark, and his great-niece’s father-in-law Henry Smith. During a visit by Brother David Smith to the Belpre Historical Society, Brother Smith was able to view the Adjutant’s Meeting Minutes Book for the A.H. Browning GAR Post. Most of the minutes were written by Brother Smith’s 4th Great Uncle John J. Clark in his duties as Adjutant. To be able to hold the very book that his uncle wrote in was unbelievably special. 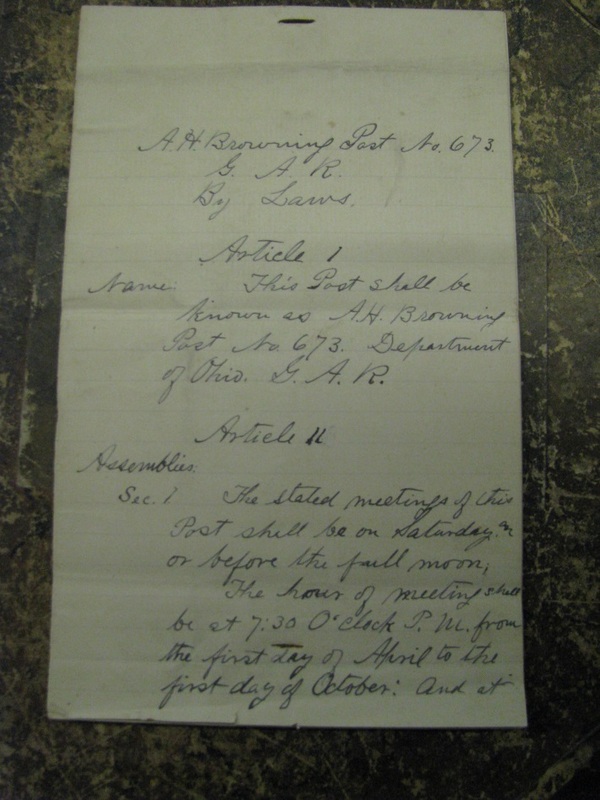 Even more so, was the fact that the Post’s Bylaws were written out by hand on notebook paper, with each Comrade of the Post signing the Bylaws. 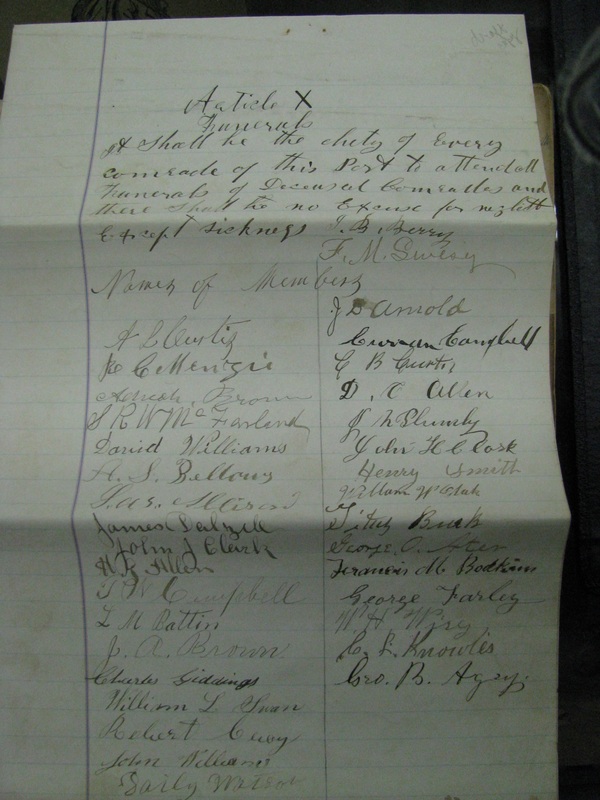 Brother Smith had the opportunity to hold those very sheets of paper that his 3rd Great Grandfather, two 2nd Great Grandfathers, and his 4th Great Uncle had signed was simply moving. Ninety-Second Ohio Volunteer Infantry, 949 men, N. H. Van Vorhes colonel, organized at Marietta, Washington County, August-September, 1862; made two expeditions into Western Virginia before mustered in or uniformed; mustered October 1, 1862, ordered to the Kanawha valley October 7, serving the year out in Lightburn's Kanawha Division; January 7, 1863, ordered to Nashville, Tennessee; served in Tennessee and Georgia in 1863; February 22, 1864, entered upon the Georgia campaigns, assigned to First Brigade, Third Division, Fourteenth Army Corps; crossed into South Carolina in February, 1865, and marched through that State and North Carolina; through Richmond to Washington in May, 1865, and there reviewed; mustered out at Washington, June 10, 1865, 488 men, Lieutenant Colonel John C. Morrow commanding. 92nd Regiment Infantry. Organized at Camp Marietta and at Gallipolis, Ohio, August-September, 1862. (Cos. "A," "B" and "C" garrison duty at Gallipolis, Ohio, September.) Ordered to Point Pleasant, Va., October 7, 1862. Attached to District of the Kanawha, W. Va., Dept. of the Ohio, to December, 1862. 2nd Brigade, Kanawha Division, W. Va., Dept. Ohio, to February, 1863. Crook's Brigade, Baird's Division, Army of Kentucky, Dept. of the Cumberland, to June, 1863. 3rd Brigade, 4th Division, 14th Army Corps, Army of the Cumberland, to October, 1863. 1st Brigade, 3rd Division, 14th Army Corps, to June, 1865. SERVICE.--March to Charleston, W. Va., October 14-November 16, 1862. Duty at Camp Vinton till January 1, 1863. Moved to Tompkin's Farm and Colesworth January 1-3. Moved to Nashville, Tenn., January 7-22, and duty there till February 17. Moved to Carthage, Tenn., February 17, and duty there till June 5. Moved to Murfreesboro, Tenn.. June 5. Middle Tennessee or Tullahoma Campaign June 23-July 7. Hoover's Gap June 24-26. Tullahoma June 29-30. Occupation of Middle Tennessee till August 16. Passage of the Cumberland Mountains and Tennessee River and Chickamauga (Ga.) Campaign August 16-September 22. Near Graysville September 10. Catlett's Gap September 15-18. Battle of Chickamauga September 19-21. Siege of Chattanooga, Tenn., September 24-November 23. Reopening Tennessee River October 26-29. Brown's Ferry October 27. Chattanooga-Ringgold Campaign November 23-27. Orchard Knob November 23-24. Mission Ridge November 25. Pursuit to Graysville November 26-27. At Chattanooga till February 22, 1864. Demonstration on Dalton, Ga., February 22-27. Tunnel Hill, Buzzard's Roost Gap and Rocky Face Ridge February 23-25. Atlanta (Ga.) Campaign May 1 to September 8. Demonstrations on Rocky Face Ridge May 8-11. Buzzard's Roost Gap May 8-9. Battle of Resaca May 14-15. Advance on Dallas May 18-25. Operations on line of Pumpkin Vine Greek and battles about Dallas, New Hope Church and Allatoona Hills May 25-June 5. Operations about Marietta and against Kenesaw Mountain June 10-July 2. Pine Hill June 11-14. Lost Mountain June 15-17. Assault on Kenesaw June 27. Ruff's Station, Smyrna Camp Ground, July 4. Chattahoochie River July 5-17. Peach Tree Creek July 19-20. Siege of Atlanta July 22-August 25. Utoy Creek August 5-7. Flank movement on Jonesboro August 25-30. Battle of Jonesboro August 31-September 1. Operations against Hood in North Georgia and North Alabama September 29-November 3. March to the sea November 15-December 10. Siege of Savannah December 10-21. Campaign of the Carolinas January to April, 1865. Fayetteville, N. C., March 11. Battle of Bentonville March 19-21. Occupation of Goldsboro March 24. Advance on Raleigh April 10-14. Occupation of Raleigh April 14. Bennett's House April 26. Surrender of Johnston and his army. March to Washington, D.C., via Richmond,Va., April 29-May 20. Grand Review May 24. Mustered out June 19, 1865. Regiment lost during service 4 Officers and 47 Enlisted men killed and mortally wounded and 1 Officer and 192 Enlisted men by disease. Total 244.